The last few weeks have been busy getting ready for and attending Protospiel Milwaukee. Protospiel is a gathering of designers, testers, and sometimes publishers and there are a few held in various places around the US. A few of my Internet besties were in attendance, so it was a trip I wasn’t going to miss for the world… which meant I needed to have games ready. I slammed the latest incarnation of Hedeby together in the last week before the show. I had an epiphany that I thought would open the game up quite a bit but limit the confusion at the same time. Well…. we tested it once and I can tell you… it did streamline play quite a bit, but it did nothing to open it up or make it go faster. In fact, we didn’t finish that test. So, back to tweaking. 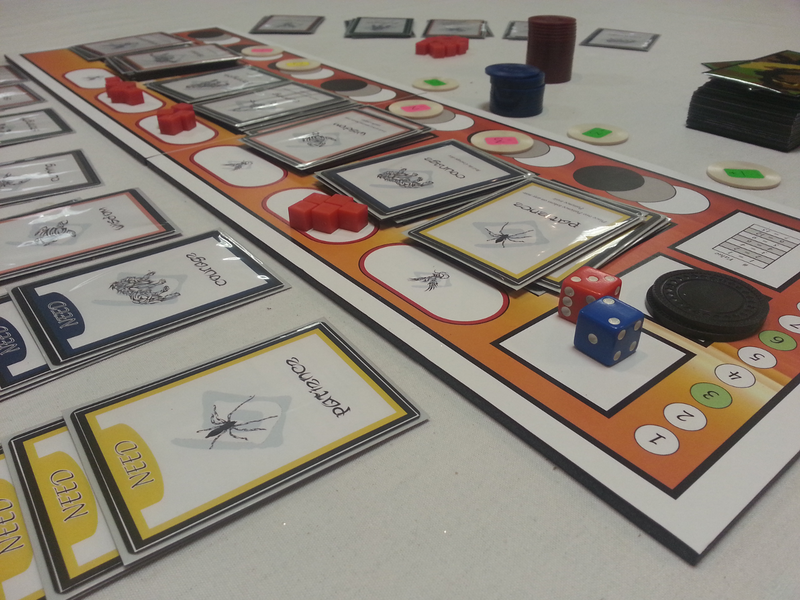 I hope to have a newer version this week to test with my group. Depending on how that goes, I’ll write it up proper. Neil Roberts has been working hard on making Dead End better and I like a lot of his changes. He took a very analytical approach to the design and looked at the various feedback loops present and how to maximize on the ones we wanted to highlight. We got in a few tests and overall, I’m pretty happy with the game. The next step will be tightening up the cards and minimizing the amount of reading that needs to be done to play the game. I hope to have a full write-up of the current design within the next week. Of all the games I took with me, this was the one I was the most uncertain about. I only tested it a total of two times and immediately invested a great deal of time into making it pretty. I desperately wanted it to test well… and it did! I think it only hit the table twice, but one of those was a blind test and they were all excited about it! I looked over once and was greeted with a warm smile and a thumbs up. Moments like those make me feel great as a designer. 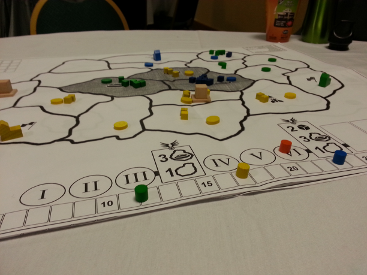 I brought Leathernecks with me… not to playtest per-se, but just to get it on a table and show it off. It saw quite a bit of play and everyone was enthused about it. I’m going to be pitching this one to anyone that will listen this summer, so it was reassuring to get some positive feedback. 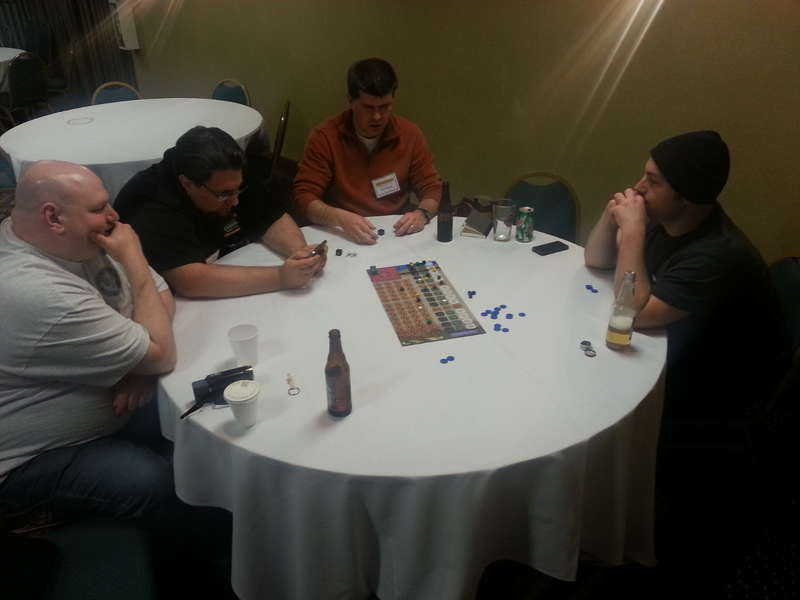 I went to Protospiel to get some real work done, but I ended up socializing more than I intended… and that made the trip extra special. 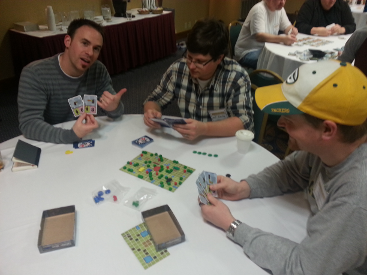 I played very few of my own games, but got to see a large number from other designers. 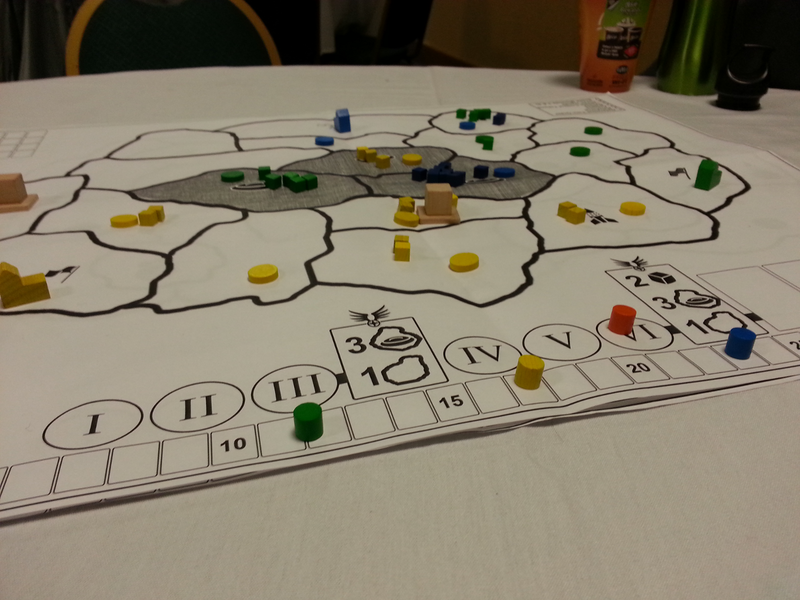 Dawn Sector – Saturday started off with this game from my good friend Grant Rodiek. It hit the table a great deal and I personally sat in on two plays. I really like this design and I’m pretty sure everyone who played it agreed. He received some great feedback and touched up a few things as a result, but the game is solid right now. It’s publisher ready and I think he’s going to do well with it this year. 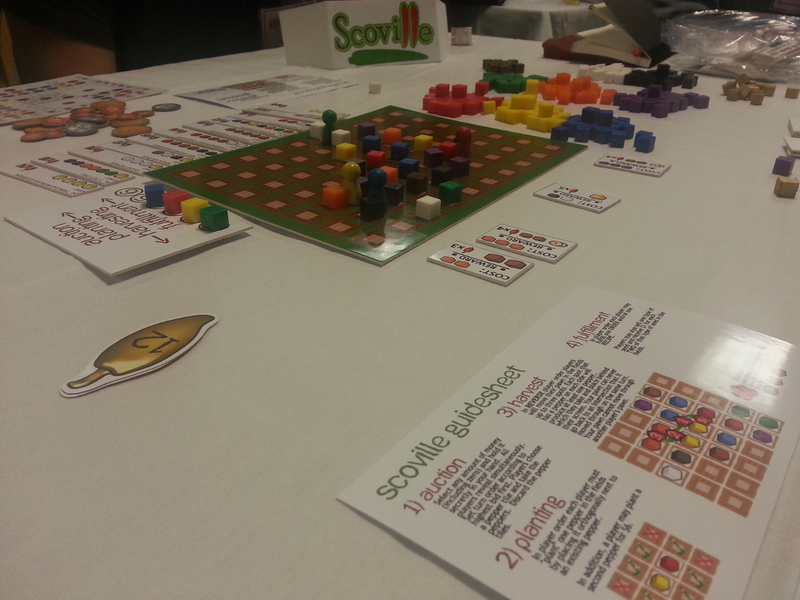 Scoville – I was told that I must sit in on Scoville after lunch… so I did. Great decision. Scoville is a wonderfully chromatic game from Ed Marriott in which the players represent pepper farmers who are cross-pollinating peppers to make new breeds. 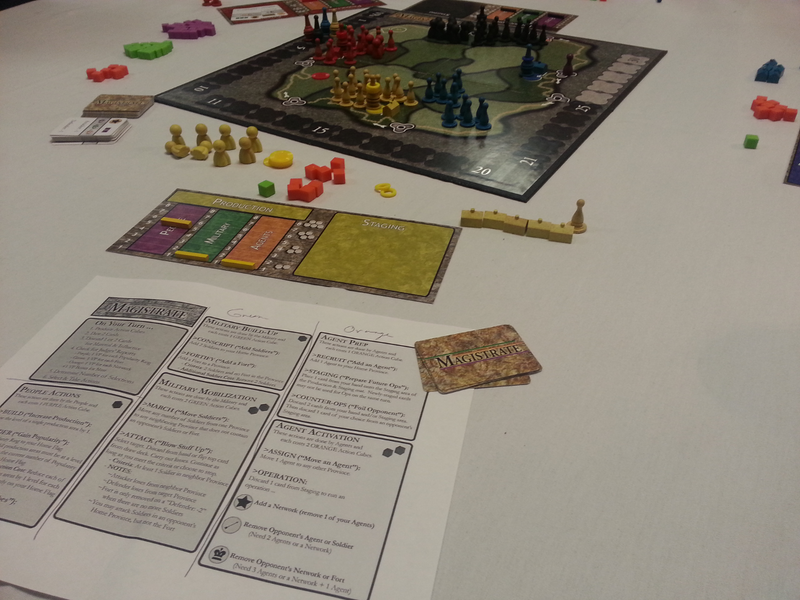 The game has a very Euro feel with a tight board, bidding, and community goals. This might have been the most talked about game of the show and it deserved the top spot. It came out of nowhere and really blew people away. 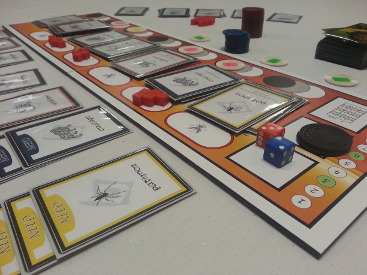 Magistrate – Another good friend, Matt Worden, asked me to play a few of his games. Magistrate has been a huge project for him for over a year. The game has gone through nearly every conceivable change and came out smiling. It is an area control game with three different control groups and tons of interesting mechanics to back it all up. To top it all off, it looks great too! Matt has already told me that he’s making some changes based on the feedback and I’m in favor of all of them. This game is going to rock, I promise you. 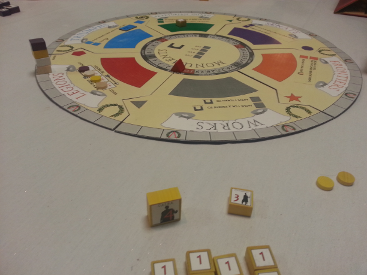 For Goods and Honor – The second game I tested from Matt. This is a simple little chit-pull game (which already wins because of that) coupled with a negotiation mechanic that shines. Draw chits from the bag, keep or sell. Players advertise what they’d pay for a particular type, but he has also built in a little wiggle-room type mechanic to help players negotiate even further. I loved this game and I can’t wait to play it again. I’m not sure it needs any more attention, but I’m sure Matt won’t leave it alone long and will make all sorts of little adjustments… particularly to the end-game scoring. 69 A.D. – Brett Myers allowed us the opportunity to play his self-proclaimed “medium weight Euro.” When he set everything up, I was overwhelmed, but man did this game play slick. 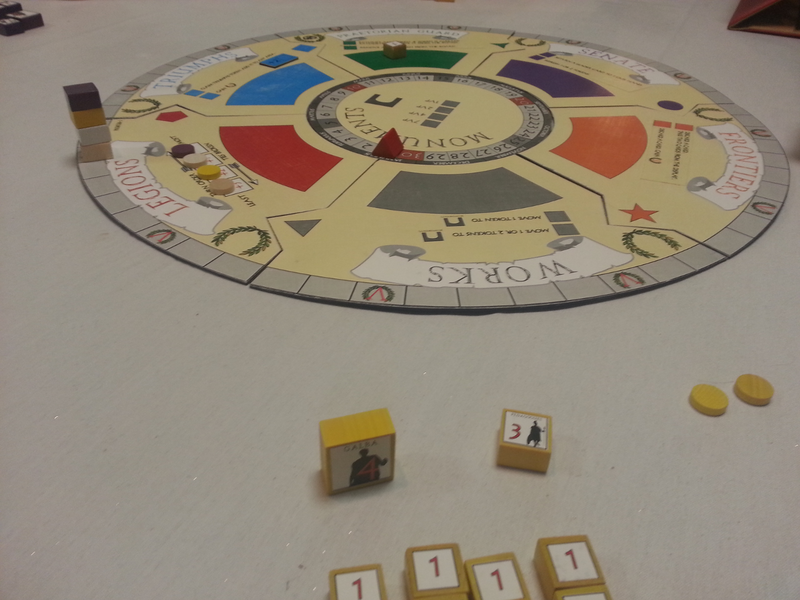 The entire board is a kind of large rondel which breaks the game up into a bunch of little mini games. You place your people in the various areas in a sort of area-control mechanism, and after all players have placed, each area is resolved which results in a special action. The design is super clean and needs very little work. I can’t wait to see what becomes of this game. I’m sure Brett will have no problem finding a publisher as soon as he’s ready. The Right of Passage – This is the last game I took pictures of and I was so excited about it the first time I played that I forgot to take any! I begged designer Matt Loomis to bring it back on Sunday so I could give it another go and take pictures. This was the game of the show for me. 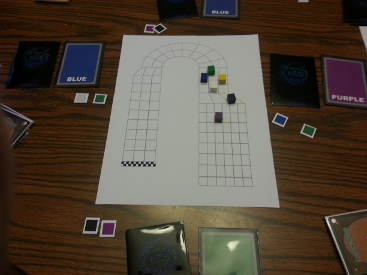 It’s a simple set collection game mixed with a sort of social deduction game. Each turn you take two cards from the seven different types. You perform the action on both of the cards taken, then, you keep one card and discard the other face down. In this way, it becomes difficult for your opponents to know just what you are keeping. Each action manipulates either the game state or the final scoring and it all tied together perfectly. I’m always amazed by designs that give you a few simple choices, but offer rich game play and this game achieves all that with grace and style. I would have bought this game on the spot if it were available… and that’s semi-remarkable because I don’t spend money on games. Overall, the trip was a massive success for me. I got to hang out with some old friends, and made some awesome new friends. I played some amazing games and got some great feedback for my own. I offered my services to help others and received interest for future playtesters of my games. I met some publishers and had great conversations. I couldn’t have asked for more. 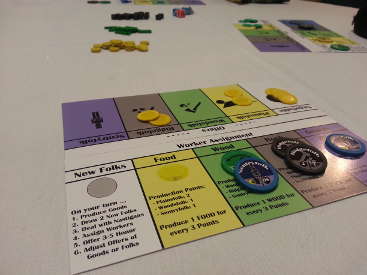 Before I left for Milwaukee, I joked that I’d be designing a game during the weekend of Protospiel. It was a semi-joke really as I already had an idea in mind, I just needed to put it on paper. I actually did start tackling that idea over the weekend, but it never materialized as a finished game… what did happen, however, was that I designed a new game during the twelve hour drive home! I’ve always wanted to design a betting game, and I was thinking about this horse racing game that was at the show… so I pushed all those ideas together into one cohesive design. The idea is to make the betting portion of the game predominant and the racing game a secondary mechanism. I have the first prototype done and preliminary testing with myself is promising. I should get it to the table next week and try it out. If it works out… I may need some testers. Until then, as always, thanks for reading!